When Pagan Kennedy wrote her 2012 New York Times Magazine history of home pregnancy testing, it didn't mention Margaret Crane, the product designer who created, designed and championed the test and all it stood for: the right of "a woman to peer into her own body and to make her own decisions about it, without anyone else — husband, boyfriend, boss, doctor — getting in the way." That article flushed out Crane, who had not spoken widely about her role in the contentious and fascinating history of home pregnancy testing. Crane contacted Pagan, and now Pagan has published a much more definitive account of the secret history of the test, which combines product design, office politics, regulatory capture, medical ethics, and, of course, the battle for women's control over their bodies. 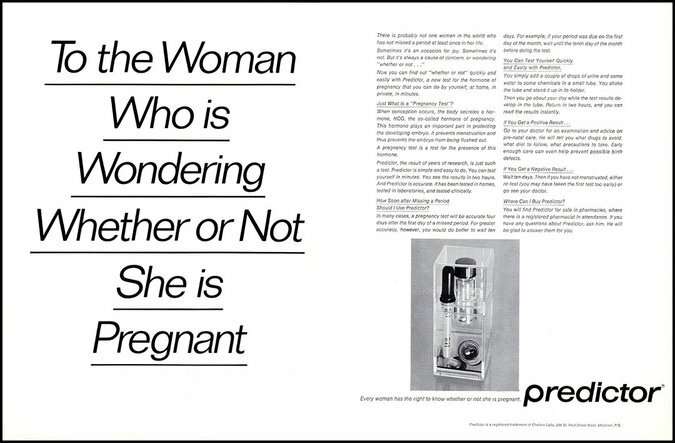 In 1967, Crane was a 26-year-old product designer at Organon Pharmaceuticals when she spotted a lab-bench lined with pregnancy tests awaiting results. It was a fraught moment for women's sexuality: though the "sexual revolution" was in full swing, abortion was still illegal in most of the USA and employers could fire women for getting pregnant. Crane built a prototype of a home pregnancy test and presented it, only to have the idea dismissed as incompatible with the business, which relied on goodwill from doctors who'd stand to lose fortunes if women could administer pregnancy tests without professional assistance. But when Ornagon's parent company caught wind of the idea, they green-lit it, and the company proceeded with the project -- without informing Crane. Crane learned that there was a product planning meeting coming up and she crashed it, putting her prototype on the table alongside the frilly, flowery, useless gadgets that the all-male design team had mocked up. Ira Sturtevant, who oversaw the project, picked Crane's design -- and then the two fell in love and began living with one another in secret (they had separate phone lines brought into their apartment, each ringing on one side of the bed!). This was the start of the public policy fight over home pregnancy testing, which featured moral panic over teenagers testing their pregnancy status without parental oversight; condescending male doctors and editorialists asserting that women "have a hard time following even relatively simple instructions" especially "in a state of emotional anxiety." As Kennedy points out, this is a microcosm of many fights that followed, such as home HIV testing, and the ongoing battle over the right to buy birth-control pills over the counter. Kennedy's article does a beautiful job of bringing her subject to light and connecting it to these wider policy fights -- and it's also a dismal reminder of how little has changed in the fight for women to control their own fertility in 50 years. In January 1968, Ms. Crane heard a rumor that her bosses were going forward with the home pregnancy test. She learned there was going to be a strategy meeting where men would discuss the design of the new product, and decided to crash it. She found her boss in a conference room with a group of freelance product designers. On the table, the designers had lined up their proposed models. In an effort to appeal to female customers, the male designers had covered them in flowers and frills. Ms. Crane thought this was insane: What customer would want to analyze her urine in a box with a tassel? She slid her prototype into line with the others. Its clear plastic walls showed off the minimalistic lab equipment inside. Then, with a glance at her boss, she took her seat at the table, challenging him to throw her out. He didn’t.